Socca, wha??? Oblivious to this simple pleasure until recently, it is now here to stay in my eating life. Socca is a sort of flatbread made from chickpea flour. Chickpea flour is a dream, whether you have a gluten intolerance or not. I have found it in bulk at natural groceries, and in Bob’s Red Mill brand packaging at bigger stores. It’s one of the less-costly wheat flour alternatives and packs a protein punch. Socca is nutty in flavor, crunchy in parts, springy in others, and an altogether savory pancake. Good olive oil is key to the flavor, which is certainly at the ready in Nice where you can buy socca on the street (add that to my South of France daydream). Though traditionally eaten hot out of a cast iron skillet and sprinkled with crushed black pepper, I eat it all kinds of ways. 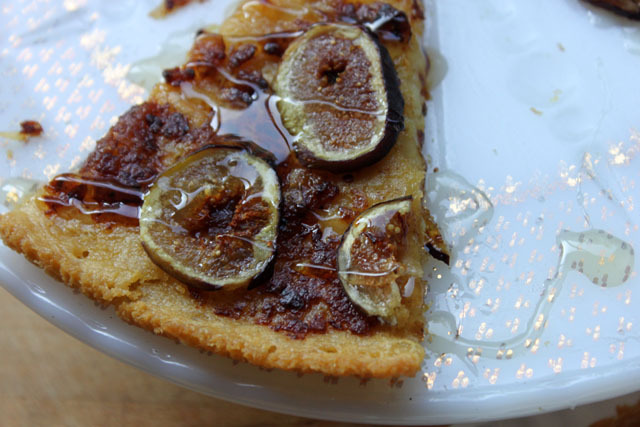 The other night, topped with with figs, onions, and honey, it was dessert. How did this dish come together? 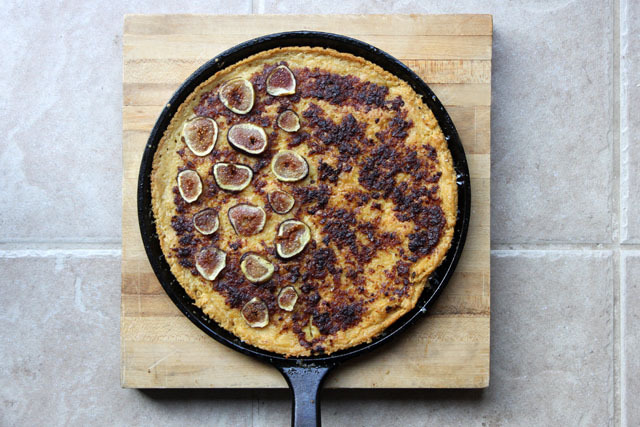 My friend Mary introduced me to the cookbook Bean by Bean, which I have been wearing out since I checked it out of the library, and my friend Drew got me thinking about roasted fresh figs after posting a FB photo of a mean looking peach prosciutto pizza made by his talented girlfriend. Which reminds me, this socca could also be an incredible main course: just add arugula, prosciutto, and cheese (taleggio, chèvre, or gorgonzola) to the onions and figs. 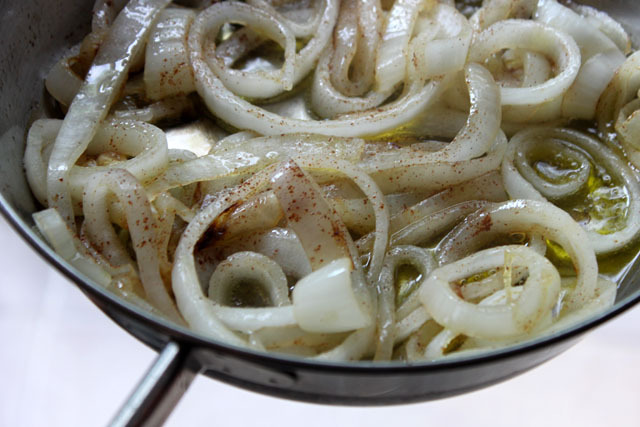 Slice one onion and place the raw onion rings in a pan on medium heat with a few tablespoons olive oil. Sprinkle with a teaspoon of cinnamon. After a few minutes of cooking and stirring, turn the heat down to low and cover the pan. Let the onions caramelize for about 20 minutes (they will become translucent and some will turn brown and crispy). 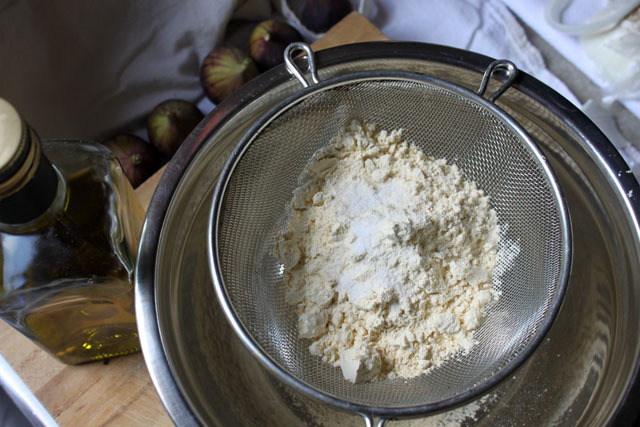 Puree the onions in a food processor or blender to make a spread (you may need to add a bit of olive oil). Preheat the oven to 450-degrees (be sure the oven is up to temp. before putting the socca in to bake). Sift together the flour & salt and whisk in 1 2/3 cups water and 1 tablespoon olive oil until smooth. The batter is thin and a bit bubbly. Place a cast iron skillet on medium heat. When it’s hot, pour 1/4 cup olive oil on the bottom. The oil should ripple with heat but not smoke. Give the batter one last whisk and pour into the skillet of hot olive oil (it will pop and sizzle!). Using a pot holder, place the skillet in the oven. Bake until the edges pull away from the pan and the bread is golden and the top is firm, 25 minutes. 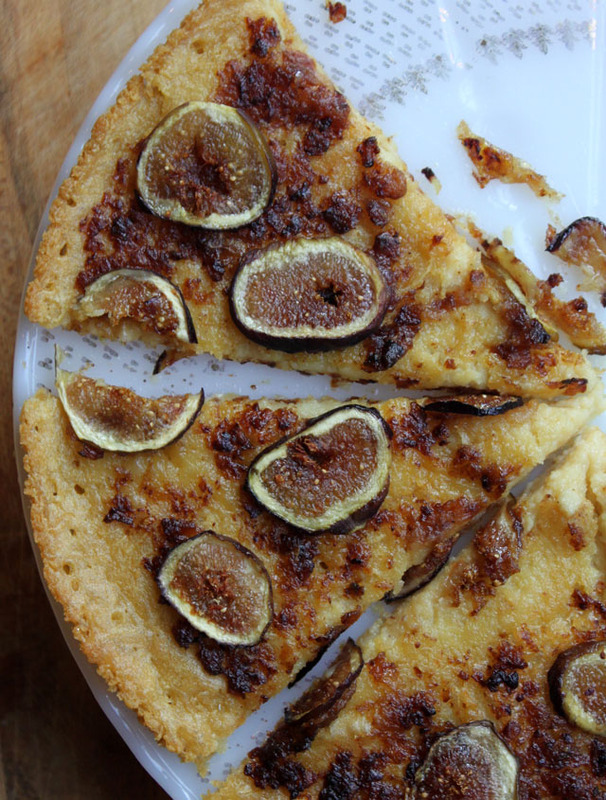 Spread onions over the socca and place sliced figs on the top. Bake for about 5 more minutes in the oven. To remove the socca, run a knife around the edge between bread and pan, and it will slide right out. Slice or break apart and serve with drizzled honey. I do have a considerable amount of flour left in the bag and it’s been around for over a year now because…I mean, how much flour can I honestly put on my face?? So….this sounds great! I think I’ll try it tomorrow – the ingredients are so simple, I always have all of them in the house. You’re welcome – I hope you enjoy it. I will try one of those masks soon… it makes sense to put chickpeas on your Face! Looks fab! I’ve been on a fig craze and I’m happy to see something new to make! shop class needs to make a comeback. This looks AMAZING! Seems a good crowd pleaser or dish to bring to a party. Thanks for sharing. Figs are awesome, aren’t they? 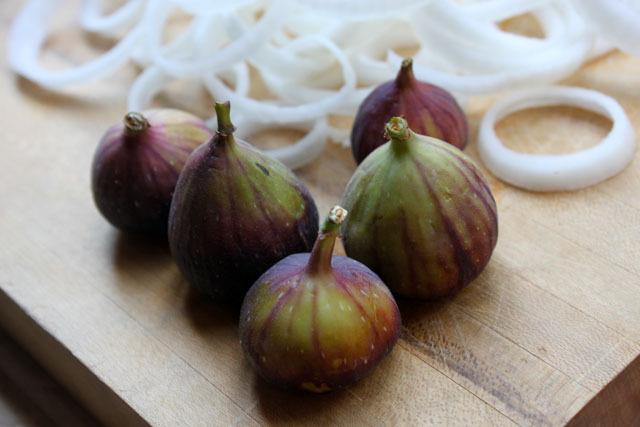 I used fresh for the first time last fall when I made a fig braised lamb for my husband and everyone thought the figs were the best part! Definitely a crowd pleaser… plain or loaded with toppings! It is best eaten hot or warm, but the batter can be made in advance. Oh man! This looks most excellent. Going to have to try it soon. Also, for another riff on caramelized onions & dough: http://smittenkitchen.com/2007/10/butternut-squash-and-caramelized-onion-galette/ More of a fall thing, but wonderful. Reblogged this on Just a little knowledge.